Hello and welcome to another wonderful edition of Mastication Monologues! After a very long weekend of wild adventures with Janice, I bring you another series of food reviews in Chicago. Today’s post involves Crisp, a Korean fried chicken establishment that made me think of my time in the Land of the Morning Calm. While Janice and I were trying to figure out where to grab lunch, we settled on Crisp since her friend gave it rave reviews. I met him once, and he seemed like a trustworthy guy aside from his crazy moves he was busting out on the dance floor. I heard that it was Korean fried chicken, and I realized that this was the second time I’d be getting fried chicken with Janice (the first was a sweet memory) I crossed my fingers that it would be just as scrumptious. My hopes were completely fulfilled and then some. Upon walking in, we had to shimmy our way past the overflowing tables and dining counters that were filled to the gills just to put in our order. 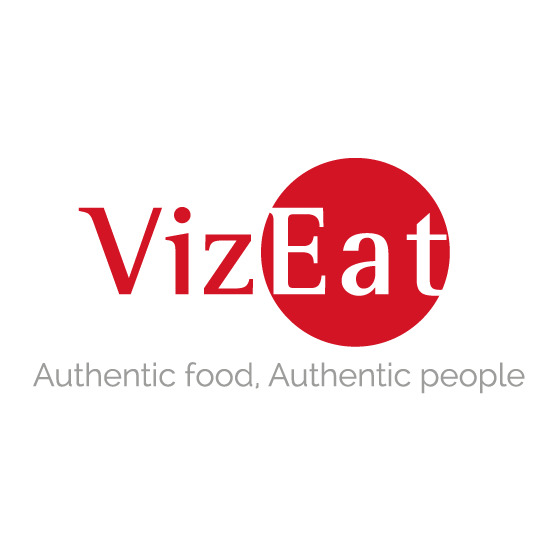 While looking at the menu, I could see some of the Korean influences like the focus on fried chicken, bibimbap (or the more Americanized moniker “Buddha bowls”), and different types of kimchi or pickled vegetables. 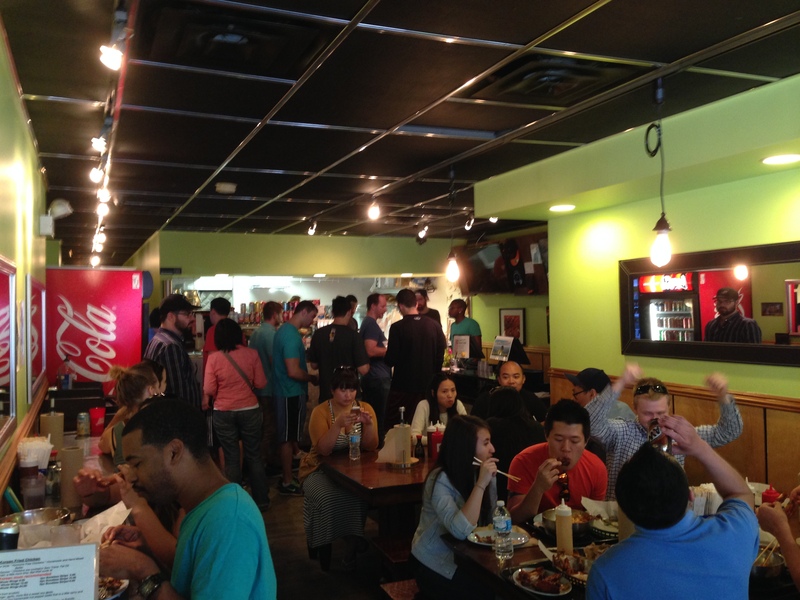 However, they also have burritos, sandwiches, and sides. Now, you might be wondering, ‘Fried chicken is pure Amurika. 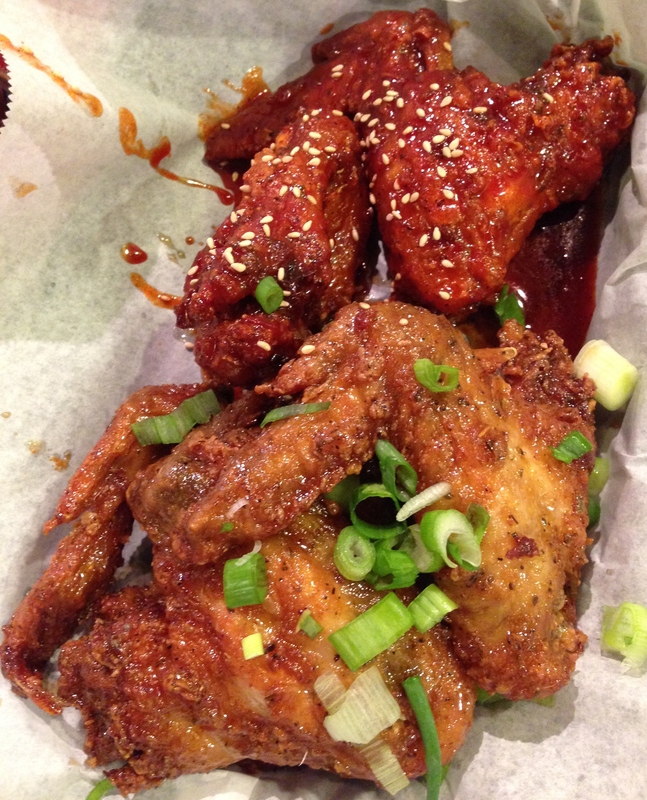 What makes Korean fried chicken different from the Dirty South classic?’ Well, the contrast lies in the sauce they slather on the crunchy chicken pieces. They have four different flavors you can slap on bone in/bone out wings and whole/half chickens. I always love my chicken wings, so I went with the ten wing option. The cashier chuckled, gave me a look, and asked me if it was my first time there. I replied in the affirmative, and he said that I wouldn’t be able to finish ten wings since they’re huge. 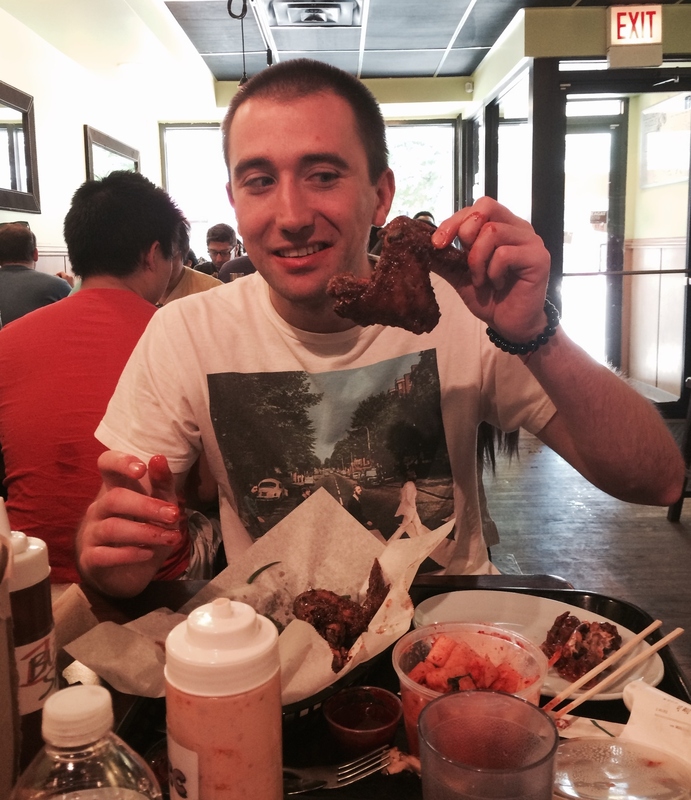 So, I took his word for it and dropped down to five wings ($8.95), three Seoul Sassy sauce and two Crisp BBQ sauce. I naturally had to try their kimchi, so I didn’t get the typical cabbage but rather the 총각 (chonggak, literally “bachelor” since it was considered a kimchi so simple even single men could make for themselves) radish kimchi ($3.95). 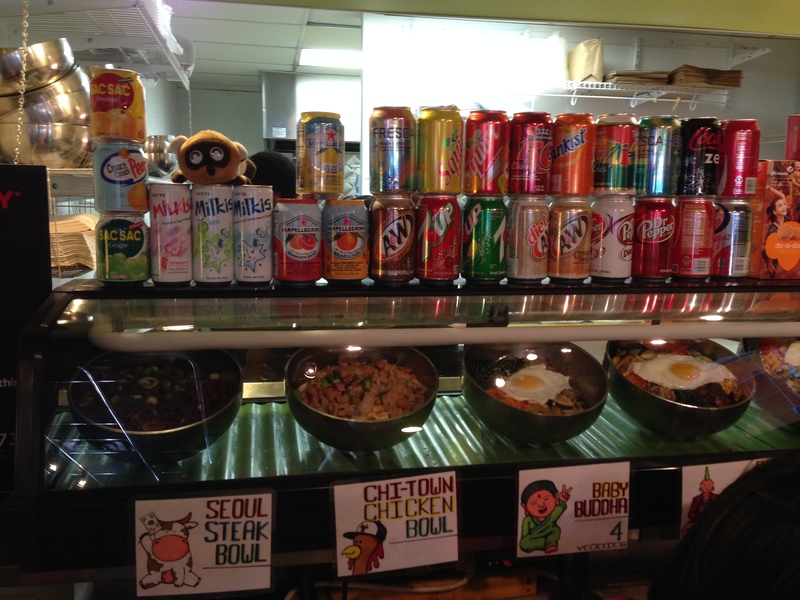 While waiting I saw a lot of different Korean drinks like Milkis stacked up above the bibimbap display or the Bacchus-D energy drink box on our table. 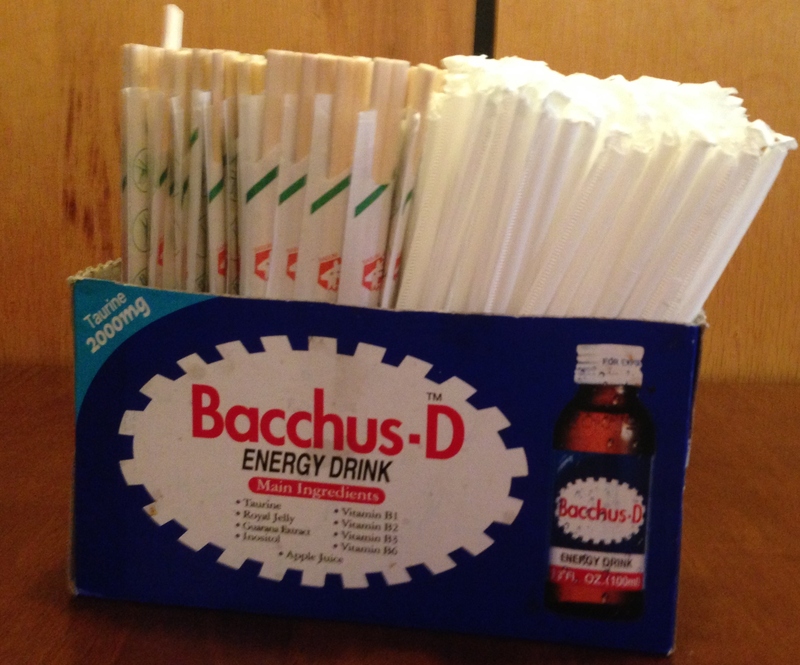 It’s a popular on-the-go beverage for the 빨리 빨리 (bbali bbali; fast fast) Korean lifestyle, and it tastes like drinking liquid Sweet Tarts. They called my name, and I snapped out of my memories to pick up my grub. I’m so glad the cashier was honest with me about the size of the wings because these were gargantuan compared to their Buffalo Wild Wing or Hooter counterparts. I think Janice put it best that they chopped them off pterodactyls. If that’s what they did, the prices certainly didn’t reflect the costly nature of the undertaking. It was a lot of food for a reasonable price. I started with the Seoul Sassy sauce, and it definitely lived up to its name. It was a sophisticated blend of garlic, ginger, soy sauce, and a bit of molasses for a flavor profile that left my mouth watering. The chicken itself was great with plenty of white meat, and the skin was incredible. It wasn’t greasy or soggy and was a perfect representative of the restaurant’s name. As for the Crisp BBQ sauce, it reflected a meeting of East and West with the smokiness of a North Carolina pig roast, and the spice of Korean gochujang that let you know you were consuming something spicy but not in a mouth-numbing manner. 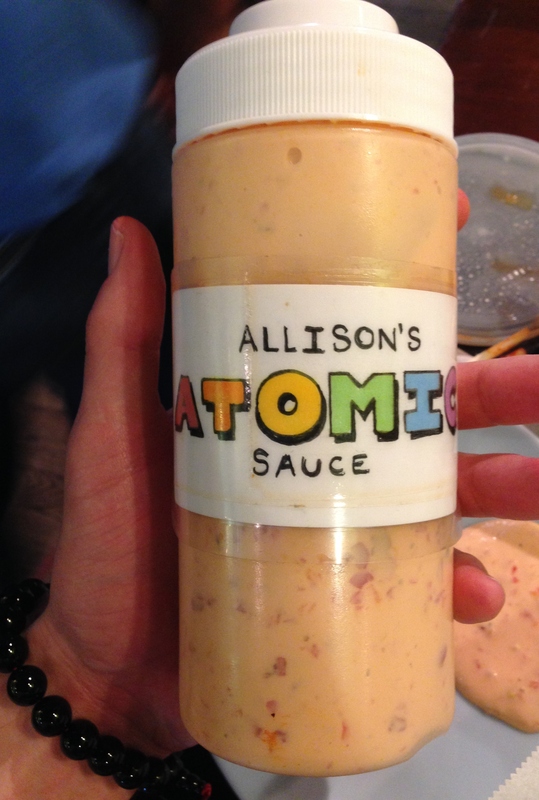 I couldn’t pick between the two sauces, but there was a game-changer that was on every table: Allison’s atomic sauce. Like the A-bomb, it blew me away. It was a mild, chipotle ranch/mayo mixture that had a cooling effect on the wings yet provided a very subtle peppery zing with each bite. 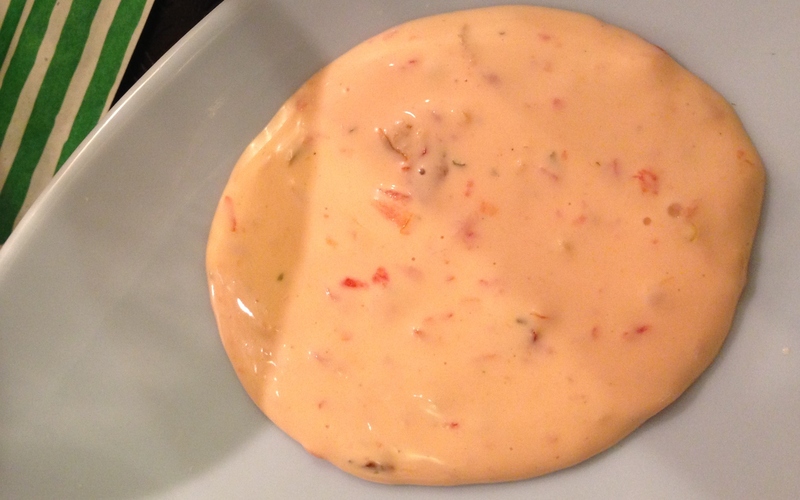 By my third wing, I was slathering this weapon of mass consumption over every square inch of my chicken. After finishing my five wings, I had two of Janice’s and still could have eaten more. Alas, I just focused on my kimchi. 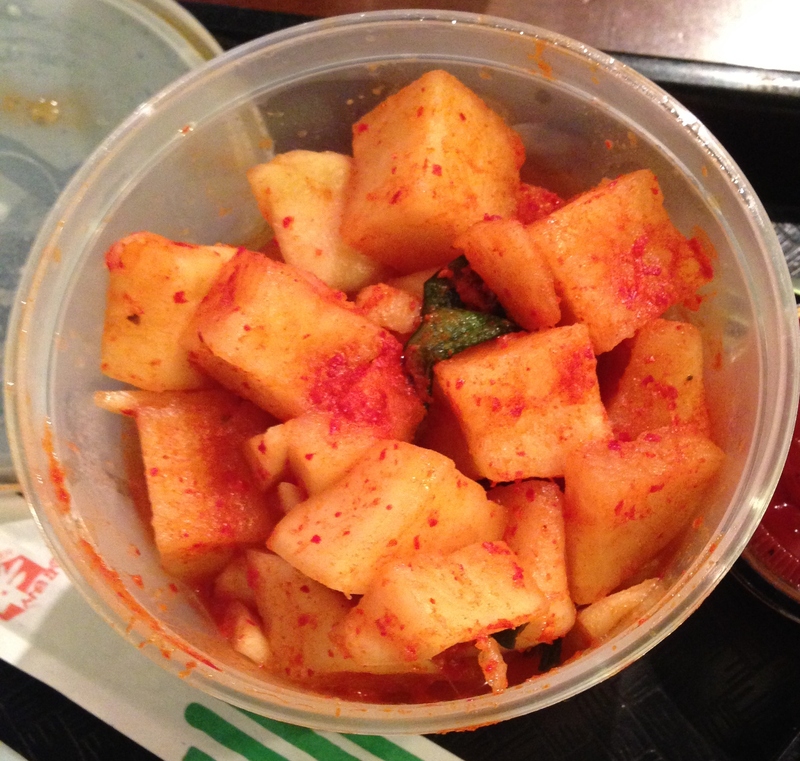 It was cubed and soaking in chili water, and it was just as good as back in Korea. The radish cubes were crispy, slightly sour, and spicy. I couldn’t even finish the tub because it was so much for so little money. By the end, I was ready to literally roll out of there a happy diner. 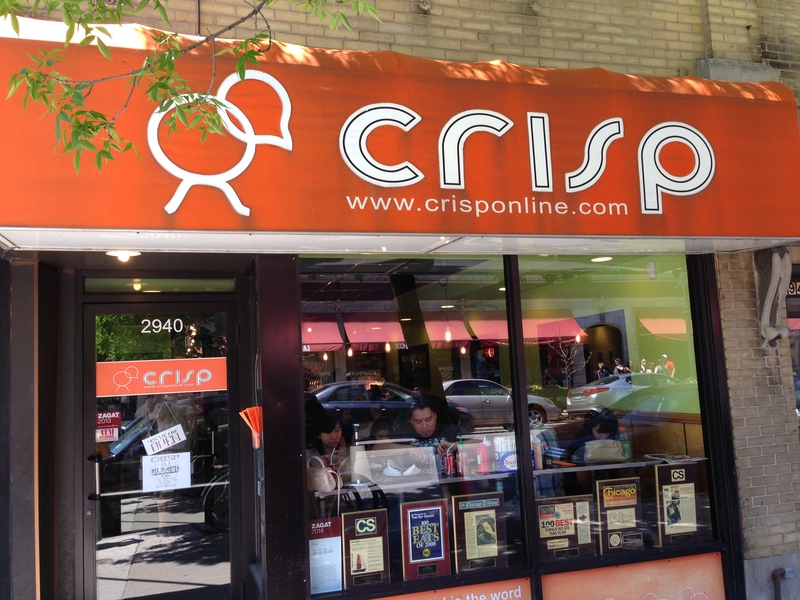 So if you want to try a Korean twist on an American classic with American sized portions and reasonable prices, check out Crisp in Chicago. 빨리 빨리! !